This is a time-tested recipe to make the easiest cannabis edibles. Anyone can do it. The best thing is it only takes a little time and a little cannabis. The end result is that you will be affected for 3-5 hours depending on the quality of cannabis that you’re using. Pre-Heat oven to 110C – 230F. Take a small amount of cannabis, approximately 1/4 or a 1/3 of a gram for each cracker, and grind it up. Then wrap the ground cannabis with aluminum foil making sure to only use as much as is required to cover it completely. Do not to double wrap it and make sure it is completely sealed. Put the wrapped up cannabis in the oven for 15 minutes. 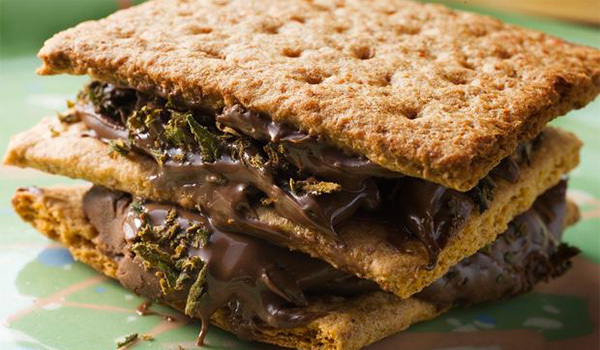 Combine the Nutella with your oven-warmed cannabis in a small bowl and then thickly spread your mixture over the crackers and top with another cracker to make a sandwich. Now wrap your cannabis infused Nutella sandwiches in aluminum foil and put them in the oven for 20 minutes. After the time is up, you can take them out and let them cool. You can eat it anytime you want now. As with all edibles, it takes anywhere from 45-90 minutes for the effects to start so don’t get impatient if you don’t feel anything right away. These Firecrackers will ensure that you are affected for several hours after consumption. Next article Holiday Gifts for "Cannasseurs"